Note: This post was written in collaboration with Erica Chin, Instructional Technologist and Medical Illustrator at Jhpiego. 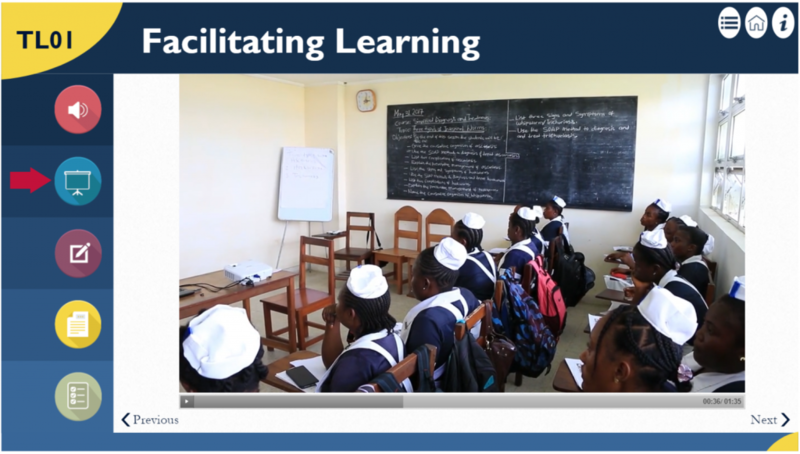 The instructional design team, led by Director of Instructional Design, Shannon Fineran, is proud to announce the release of a landmark course series designed for the Maternal and Child Survival Program (MCSP) at Jhpiego in partnership with USAID. The course is currently being piloted among health practitioners from several health care facilities in various regions of Liberia. Unlike a stand-alone training course, the faculty development program provides a blended approach and a social program delivered over a five-month period. Faculty that participate are offered a supportive environment to build confidence, leadership, change management, and teaching skills. It includes three instructor-led training sessions and two rounds of individualized eLearning course facilitated by a moderated discussion platform for peer support. The individual eLearning course is comprised of 15 modules organized into three sections: Theoretical Learning, Clinical or Practical Learning, and Student Assessment and Program Evaluation. The program is centered around the completion of a change management project relevant to improving educational quality or teaching skills. The team at Jhpiego’s Technical Leadership Office, led by Julia Bluestone (Health Workforce Team Lead) and supported by Erica Chin (Instructional Technologist and Medical Illustrator) and Alison Trump (Technical Advisor), worked closely with TechChange’s instructional designers to create this engaging, comprehensive course series that utilized interactive content presentations, knowledge exercises, resources, and individual module assessments in each section of the program. 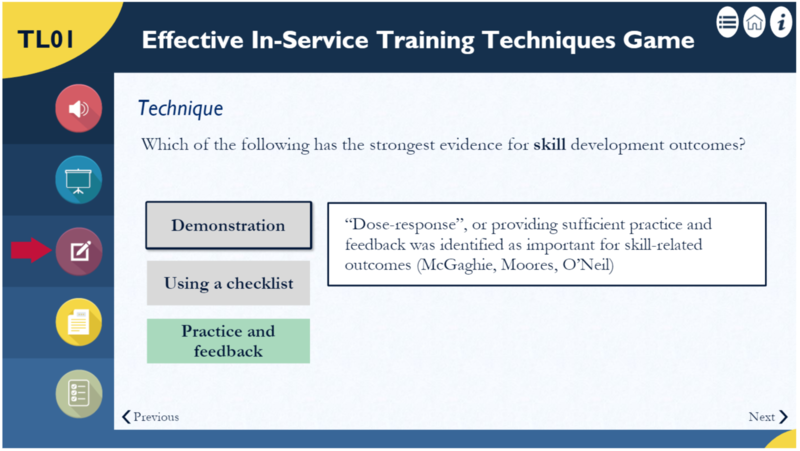 The project posed a series of delivery challenges for the instructional design team. The Faculty Development Program is intended for release in regions of low internet connectivity, prohibiting technical design strategies typically used in a more traditional eLearning course. Because of this, the course was delivered via individual USB drives with the course pre-loaded onto them. Additionally, the course’s intended audience had varying levels of computer literacy and experience with technology. To minimize potential learner confusion, the team created a single main menu to provide direct access to all modules and cohesive course navigation. The main menu, itself a separate Articulate file, included a course module tutorial, as well as “scene selection” style sub-menus for module selection. TechChange opted for a streamlined course interface design, implementing a static menu on the left side of course slides and recurrent course navigation buttons at the bottom of course slides. The Articulate publishing process was particularly complex for the instructional design team — the course needed to be offered offline, had a complex Articulate-to-Articulate branching scheme, and needed to be launched from the double click of a single button to allow for ease of use. All of these challenges resulted in new discoveries for the team. Want to learn more about how the team reached a publishing solution? Stay tuned for another blog post on how to use relative linking for offline distribution! For more information on the MCSP program at Jhpiego, please visit this link.